Chong, Barry. "Avro Arrow". The Canadian Encyclopedia, 12 November 2018, Historica Canada. https://www.thecanadianencyclopedia.ca/en/article/avro-arrow. Accessed 18 April 2019. The Avro Canada CF-105 Arrow (the Arrow) was a supersonic interceptor jet aircraft designed and built in the 1950s by A.V. Roe Canada (Avro). 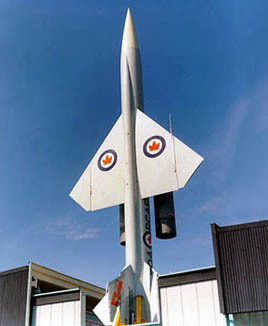 The Arrow was one of the most advanced aircraft of its era, helping to establish Canada as a world leader in scientific research and development. 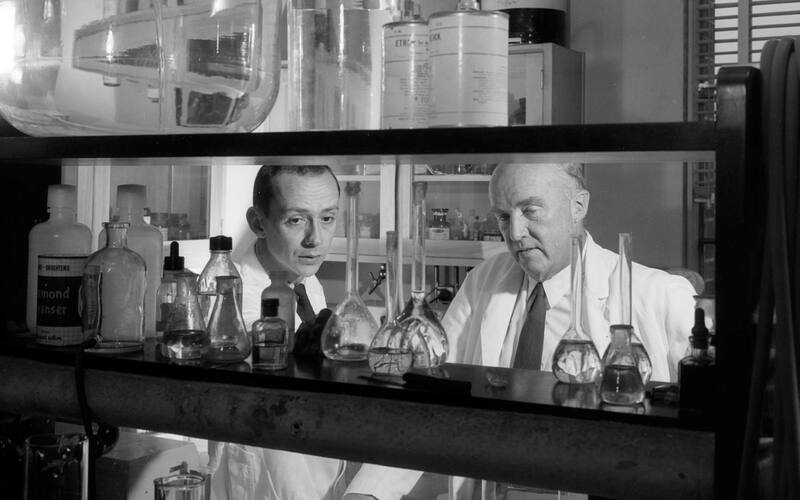 Though the Arrow was widely praised for its power and beauty, the program was cancelled in February 1959 by the government of Prime Minister John Diefenbaker. This resulted in the loss of at least 25,000 direct and indirect jobs. Many believe that the Arrow’s cancellation was a betrayal of Canada’s aerospace industry. 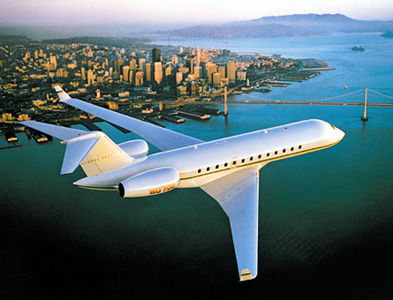 Others assert that the jet was extravagant and had little chance of competing with impending innovations. At best, Avro and the Arrow were historic examples of Canadian ingenuity and intriguing case studies of unrealized potential. Interceptor aircraft: A plane designed to attack enemy aircraft, especially enemy bombers. Nuclear escalation: An increase in the possibility or extent of nuclear attacks between nations, as well as a race to develop nuclear weapons technology. Supersonic: Capable of travelling faster than the speed of sound. Following the Second World War, nations found themselves divided among two ideological camps: the capitalist West (led by the United States) and the communist East (dominated by the Soviet Union). As tensions grew among opposing parties — worsened by espionage, proxy wars, aggressive dialogue and nuclear escalation — Canada increased its military commitment to the Western cause in what became known as the Cold War. By the 1950s, there was a growing concern that Soviet bombers would attack North America via the Canadian Arctic. (NATO intelligence suggested that such an attack could occur as early as 1954.) 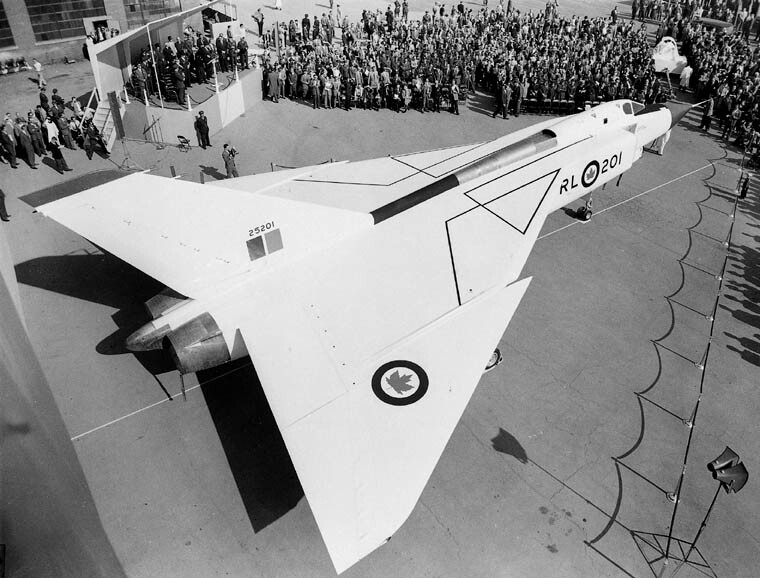 So, in 1953–54, the Royal Canadian Air Force (RCAF) commissioned Avro to design and build the Arrow: an all-weather nuclear interceptor meant to fly higher and faster than any aircraft in its class. It was, at the time, the most demanding specification in the world, and many international manufacturers believed it impossible to achieve. 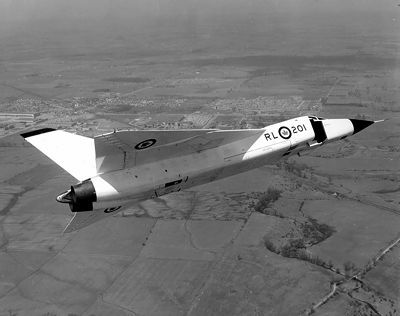 Avro CF-100 Canuck, the first jet fighter designed and built in Canada (courtesy Library and Archives Canada). Already an established British aircraft manufacturer, A.V. Roe came to Canada in December 1945 to take advantage of the country’s skilled aviation labour force	that had been left unemployed following the Second World War. The company — newly branded A.V. Roe Canada — set up shop in the Malton area of Mississauga, Ontario, at the former Victory Aircraft plant (now Toronto Pearson International Airport). Avro experienced early success with the Avro CF-100 Canuck, the first Canadian-designed military fighter aircraft. 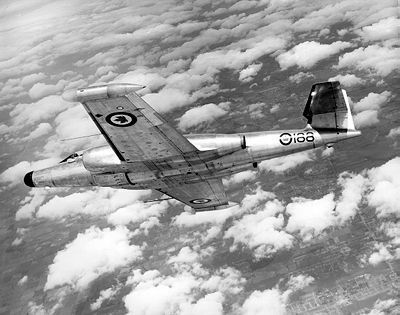 The Canuck first flew on 19 January 1950. In total, 692 planes were built, with Canuck fighter squadrons serving the RCAF, NORAD and NATO. After earning the right to build the Arrow, Avro became a dominant force in Canadian aerospace and the economy at large. By 1957, Avro employed more than 20,000 people, making it one of the largest companies in the country. With plans to build everything from jetliners to cameras that could photograph speeding airplanes, Avro drew major investment from the government and its own employees. Confidence in the company — and Canada’s aerospace industry — was soaring. Production of the Arrow drew many notable characters to Toronto’s industrial suburbs. Among them: Avro president Crawford Gordon Jr., a charismatic industrialist from Winnipeg; James C. Floyd, a renowned British engineer and the first non-American to win the Wright Brothers Medal for his work on jet transport technology; and Janusz Zurakowski, a fighter pilot from Poland	who braved the Battle of Britain before becoming the first person to fly an Arrow. The Arrow was to be an immense project — in size, scale and ambition. Weighing about 20,000 kg when empty, with a 15.2 m wingspan, the jet was, as journalist David Wilson has written, “form sublimely married to function.” It boasted the world’s first computerized flight control and weapons system. Faster than any jet in its class, the Arrow would travel nearly twice the speed of sound at an altitude of 53,000 feet. Testing the Arrow was intensive. Without computer simulation tools, the Avro team relied on wind-tunnel testing and scale model experiments. Nine models (each one-eighth the size of the full-scale planes) were launched on rockets over Lake Ontario	to gauge flightworthiness. Two additional models were launched over the Atlantic Ocean. On its first flight, piloted by Zurakowski on 25 March 1958, the Arrow broke four different speed records. Over the next year, the five “Mark 1” Arrows (i.e., the first version of the plane) would fly a total of 66 times. The more powerful “Mark 2” Arrows that were in development never flew. Despite the plane’s enthusiastic reception, both the Arrow and Avro would soon meet their end in complicated political battles and backroom deals. In June 1957, Canadians ended 22 years of Liberal rule by electing a minority Progressive Conservative	government. 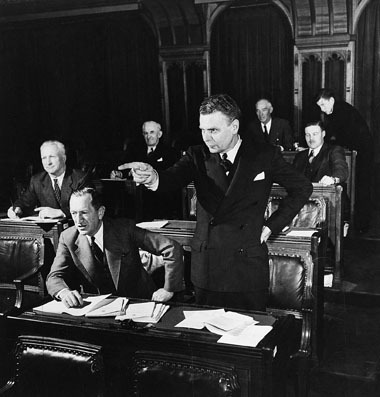 For Prime Minister John Diefenbaker, cutting federal spending (and establishing his authority) became a political priority. Money was a central factor in the Arrow’s downfall. With a total cost of $1.1 billion, the Arrow program was expensive beyond what a country of Canada’s size could normally afford. Another challenge was the Prime Minister’s poor relationship with Avro’s president. A teetotaller, Diefenbaker detested the lavish behaviour of Crawford Gordon Jr., who was known for his love of smoke and drink. The two would frequently argue. Competing technologies and narratives also weakened the Arrow’s homegrown support. On 4 October 1957 — the day the first Arrow was unveiled — the Soviet Union launched Sputnik, the world’s first human-made satellite. Global imagination (and paranoia) shifted to space; it was then assumed that nuclear attacks would no longer come from piloted bombers, but from intercontinental ballistic missiles that pass through outer space. The Arrow’s purpose was now unclear. Canada’s allies, too, were making gains in the aerospace sector. In 1958, the Arrow was the world’s fastest fighter jet, but the United States, Great Britain, France and Sweden had developed planes with superior flight range and maximum altitude. America in particular, with its existing economic and military might, consistently released cheaper planes (like the McDonnell Aircraft Corporation’s F-4 Phantom) at a much quicker rate than Canadian manufacturers	could achieve. Even those in favour of the Arrow acknowledge that had the program sustained funding, the jet would not have been ready for combat until 1962. Around the time the Arrow was cancelled, British officials requested the use of one or more of the jets for flight testing. The request was soon withdrawn, allegedly on the recommendation of the Canadian government. In a 1980 interview with the CBC, Arrow test pilot and native Briton Peter Cope suggested that Diefenbaker had not wanted Great Britain to realize that Canada had abandoned such a high-performing plane. A.V. Roe tried desperately to find a foreign buyer for the Arrow. However, Canada’s political climate, combined with the project’s cost and narrow approach to warfare, left few options. Most countries did not want to take on such an ambitious project, especially given the Arrow’s limited use in the space age. And while fans of the Arrow have since demonized the Diefenbaker government for ending the project, many historians agree that the Liberals	would have done the same. On 20 February 1959, before the Arrow could enter military duty, the Diefenbaker government cancelled the Arrow project. Overnight, more than 14,000 people, many of them highly skilled, lost their jobs. The day would come to be known as Black Friday in the Canadian aviation industry. By July 1959, all aircraft had been cut apart with blowtorches, while blueprints, models, designs and machines used to make the planes were destroyed. Scraps were sold to a Hamilton, Ontario, junk dealer for 6.5¢ per pound. Job losses grew to at least 25,000 at the time of Avro’s dissolution in 1962. Today, enthusiasts of the plane question the government’s need to so thoroughly remove the Arrow and its technical data from history. At the time, Parliament claimed it was a matter of national security, though historians like Granatstein contend that Diefenbaker acted out of spite for Gordon and his beloved company. Free from the Avro contract, the Canadian government moved to buy 66 second-hand Voodoo fighter jets (capable of less than half the speed of the Arrow) from the United States as a supplementary defence strategy. Canada also opted into the Bomarc program, a surface-to-air guided missile system resulting from the 1957 NORAD	agreement with the United States. Over the ensuing decade, however, anti-nuclear sentiment would dominate public opinion (see Pacifism). In response, Canada ultimately withdrew its armed forces from nuclear roles and shut down the Bomarc system. The total cost of the Voodoo and Bomarc purchases amounted to more than the entire cost of the Arrow program. Avro’s end was fast and tragic following the Arrow’s termination. Gordon’s resignation as president was announced in the press on 2 July 1959. He died at age 52 on 26 January 1967 in New York City, likely from alcoholism. Fred Smye, Avro’s vice president and general manager during the Arrow program, resigned in 1959. And in April 1962, parent company Hawker Siddeley Group dissolved Avro, selling its assets for $15.6 million. Still, there is little evidence to show that Avro’s end had long-term negative effects on Canada’s aviation and scientific communities. For example, Spar Aerospace	(which originally worked on the Arrow project as the Special Projects and Applied Research branch of de Havilland Aircraft of Canada) went on to design the Canadarm. And today, the Canadian aerospace industry contributes nearly $25 billion in gross domestic product	and roughly 190,000 jobs to the economy. Pieces of the original Arrow, along with models and replicas, can be found in various Canadian museums. The Canadian Air and Space Conservancy (scheduled to open in 2019 in Edenvale, Ontario) has a full-size replica of the plane, while the Avro Museum outside Calgary, Alberta, is building a flying replica. One of the largest surviving pieces of the Arrow — a nose section marked with the words Cut Here beside a jagged blowtorch line — remains on display at the Canada Aviation and Space Museum	in Ottawa, Ontario. In September 2017, members of Raise the Arrow (a group of historians, scientists, archeologists and businesspeople) discovered a small test model in Lake Ontario around Prince Edward County. Over several weeks, the team had collected data from the bottom of the lake using underwater sonar equipment. They recovered the model from the lake the next year and identified it as a precursor to the Avro Arrow program. The hunt for the Arrow’s test models and other artifacts continues to this day. Once found, they will be housed in the Canada Aviation and Space Museum in Ottawa and the National Air Force Museum of Canada in Trenton, Ontario. See also Avro Arrow: "There Never Was an Arrow. " Avro ArrowWatch a Heritage Minute feature about the political intrigue and controversy surrounding the demise of the Avro Arrow fighter jet. See also related online learning resources. From Historica Canada. Avro Arrow Digital ArchivesIllustrated fact-filled site about the manufacture and testing of the trailblazing Avro Arrow aircraft and its ultimate demise.